Grade 4 student Hannah Shein Cabahug walks for three kilometres to school, another is fetched by her mother on horseback. These are two of the 254 beneficiaries of this Flagship Program. What is the Twenty Dollar Meal Club? 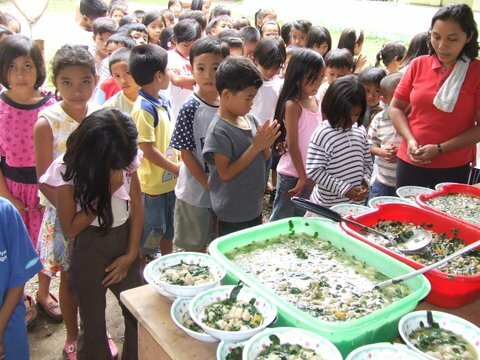 On one day per week, for the whole school year, many malnourished children at the Malasag Elementary School in the Philippines are provided with a healthy meal to start their day. 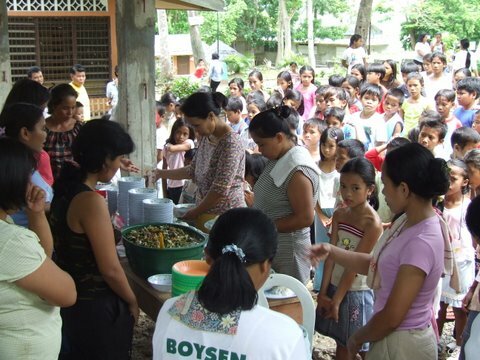 Members of the Rotary Club of Kalayaan with the help of parents from the school provide the meal. The menu varies weekly but is developed by a dietician who is a member of the Rotary Club. The Rotary Club of Tamar Sunrise has a sister club relationship with the Rotary Club of Kalayaan in Cagayan de Oro City in the Philippines. 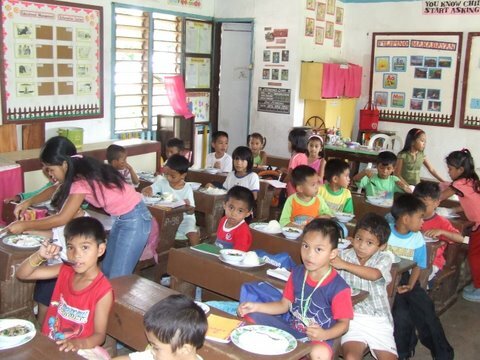 Our two clubs combined a number of years ago to adopt the Malasag Elementary School in the Barangay district of Cagayan de Oro City and set up the feeding program. 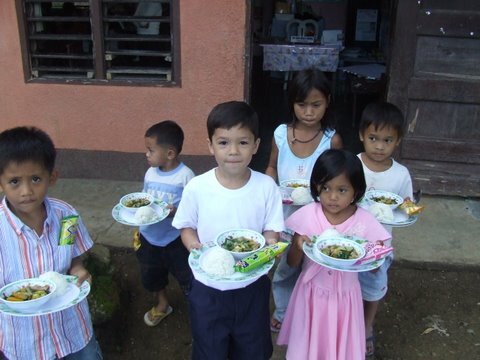 Now on its tenth year, the project first began in 2004 as a weekly feeding program for the school’s 38 malnourished children. When their health improved, the club decided to include the rest of the school’s student population as beneficiaries upon the request of their parents. 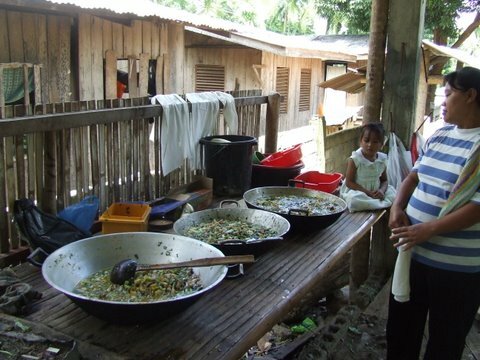 Now, on one day a week, for the whole school year, all the children at the school are provided with a healthy meal. 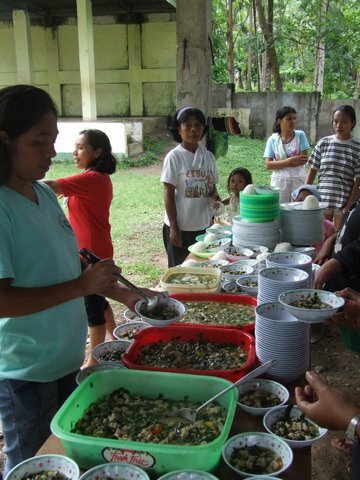 In the Philippines, this program is known as the 'Share a Meal' Project. The school ranked number 75 in the National/Division Admission Test in 2004 when the program began, and soared to number 7 four years later. Its NAT score went from 49 percent six years ago to 72 percent after three years. The success continues: The Malasag Elementary School won the first prize in Science Investigatory Project in East District 1 for 2012-2013 where its competitors were the bigger schools of the district. This project clearly aligns with one of the key areas of focus for Rotary Basic Education and Literacy where it supports involving the community to support programs that strengthen the capacity of communities to provide basic education and literacy to all. An educational component for the parents on proper nutrition and how to grow plants plus a program that ensures that students are encouraged to come to school for education, with support from the local Rotary club highlights how this program is community driven. The program is measurable by the increase in the school performance and is sustainable because of the links to local Rotary clubs and the parents. During the decade long partnership with this sister club partner program, the school has significantly improved its overall ranking amongst public schools in Cagayan De Oro City, the number of children above normal height and weight has fallen and the average score in the National Achievement Test has also improved significantly. So much so that the school is no longer regarded as a low performing school. Read here to learn more about the Project. You can help by joining or continuing your membership of the "Twenty Dollar Meal Club". For just a $20.00 donation you can help to support a child in the feeding program. The Rotary Club and our corporate sponsor St.Lukes Health, cover all administration costs. You will also receive a Certificate of Appreciation with the name of a child from the school that your donation is supporting and an annual newsletter. To join simply mail a cheque for $20 (or multiples thereof if you wish to sponsor multiple children) to: The Rotary Club of Tamar Sunrise, PO Box 1324 Launceston Tas 7250 or visit our support page to make an online donation.